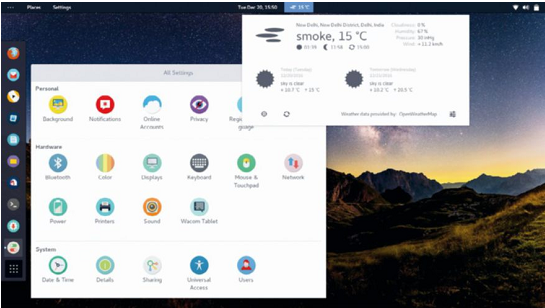 Korora 25 Gnome review – Shashank Sharma freely admits to being an Arch Linux fan, but he quite enjoys the simplicity of distros like Korora. » A beginner friendly distro, Korora is based on Fedora Linux and offers its best qualities such as stability and modern packages. With proprietary extras such as codecs and apps like VLC offered out of the box. the distro is ideal for new users eager for a distro that just works. See also: Fedora, Linux Mint. Starting from an application-rich and highly stable distribution (distro), Korora offers the latest packages and modern technologies as its base, the project throws many extras on top to make it appetising for new users. The end result is a user-friendly distro that’s usable out of the box. Understandably. Korora decided to do away with 32-bit images with its last release and has chosen to stick with its decision with the latest offering, codenamed Gurgle. But after the backlash over its decision to not offer a KDE spin with the previous release. Korora 25 once again offers users the option to download Gnome. Cinnamon. KDE. Mate and Xfce spins. Users already running a previous 32-bit release can still upgrade to the latest offering and the website offers a guide on how to do so. Despite including some third-party proprietary offerings. Korora is entirely open source and you can download its entire source code from its Git repository (repo). Like its parent. Korora uses the Kickstarter scripts to produce its releases. The distro also ships with home-grown kp tool which users can use to manipulate the Korora code to produce a remix distro of their own. The Gnome desktop doesn’t provide tooltips on mouse over, so users will have to adopt the click-to-see method to determine what any button does. can turn to Engage, the community portal that one can traverse for answers to problems or join in discussions with fellow Korora users. Barring the desktop-specific tools, the various spins all offer the same set of default packages. While this selection might not find favour with all users, the distro has struck a fine balance between utility and bloat. But that still doesn’t explain the inclusion of some highly esoteric tools such as Planner for project management. Darktable photo editing suite, and Handbrake video transcoder. Generally speaking. Korora ships with one popular tool for each task, such as offering VLC across all spins as the default multimedia player. But you can easily install software using the package management tools and this is where the spins differ. For the Gnome spin, users have the choice of either Gnome Software, YumExtender or Packages. Of these. YumEx and Software both offer a well- designed user interface and are quick to offer suggestions. You can also easily browse through the various software categories such as Education. Games and Internet etc. which makes it easy to locate the apps you wish to install. In contrast, the Control Center on the Mate spin enables you to access all the usual configurable elements but doesn’t offer the option to tweak Privacy or Sharing settings. With ease of use as its greatest feature, Korora is ideal for new users but offers no reason for Linux pros to ditch their current favourite. While not as app-rich as some distros, Korora features a nice collection of everyday applications. The single Settings interface makes the desktop very easy for novices to work with. »Ideal for new users who want a distro that doesn’t require too much out of them before being considered usable. Ideal for new users who want a distro that doesn’t require too much out of them before being considered usable.